Playful. We don’t hear that word often enough in connection to photography. But it’s summertime (at least in the northern hemisphere) and that means it’s time to relax and play. German photographer Jan von Holleben’s most recent series "Dreams of Flying" is unabashedly playful. After a period of apprenticeship in his native Germany, von Holleben moved to England in order to attend the Surrey Institute of Art and Design. In short order he received a degree in photography, founded photodebut (a non-profit group designed to help ’emerging’ photographers — www.photodebut.org), became a picture editor and director of photography for various magazines, and won a variety of awards for his own photography. Playing with that. 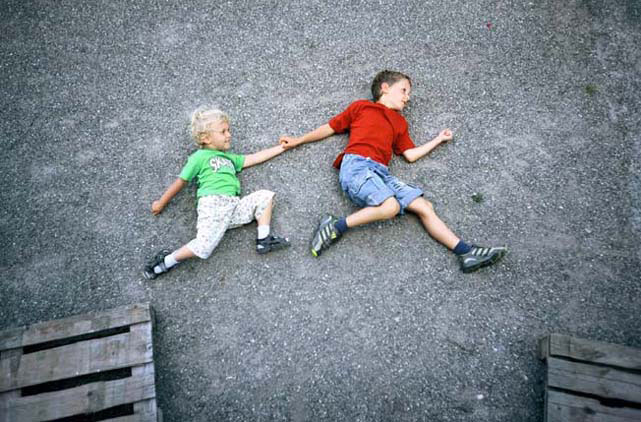 The notion of ‘play’ is a central theme of his "Dreams of Flying" series. In concept, the series is simple: he gets children to create an idea that revolves around moving through the air. Von Holleben then orchestrates that scene with props and executes it by having the children lie on the ground in attitudes that suggest flight.